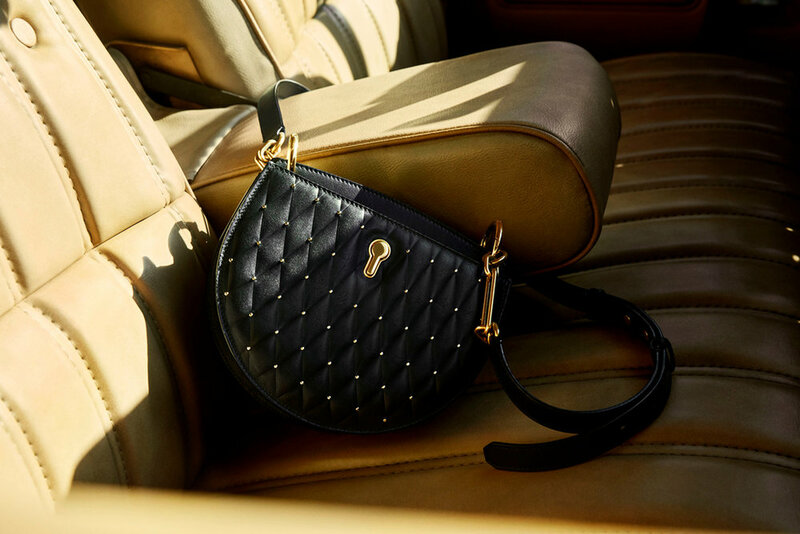 The Cecyle bag from Bally is shaking up its look for Spring Summer 2019. After a successful debut in Autumn Winter 2018, the unique half-moon shaped saddlebag named for founder Carl Franz Bally’s wife Cecyle is upping the ante with several new details, fabrications and sizes. Much like C.F.’s wife’s impeccable taste and her passionate pursuit of finely crafted leather, Cecyle is quickly becoming a bar-setting style at Bally as a sophisticated example of the Swiss brands elevated luxury goods. Its distinct shape makes it stand out among the handbag selection in today’s high-end leather goods market. The keyhole shaped magnetic closure continues to give Cecyle remarkable stylings and a new style signifier at Bally. After successful iterations in calf and croco-printed leather, Spring Summer 2019 will introduce a new diamond quilted pattern found in Bally’s archives on a bag from the 1990’s. A fine mini-studding detail marks points where the quilting lines meet creating a gentle yet tough personality to this new variation. Reminiscent of the 1970’s is a bold curved stripe colour block style in shades of gold quilting without studs which make for an impactful statement. The colour range has opened for Spring Summer on Cecyle fabrications to include lighter shades such as bone, pale green, opal as well as a tan shade that features a raffia straw front perfect for summer days by the shore. Printed croco-leather comes in an au courant mustard yellow, fast becoming a neutral among Bally’s millennial clients, and is paired with a navy and yellow woven strap abstractly recalling the Bally stripe. After launching with a medium-sized signature half-moon shape, Cecyle has scaled down for Spring Summer 2019 for warmer weather excursions that require the minimal belongings which can be worn crossbody and come in the same seasonal colors, patterns and textures as the larger styles. Drawing upon the unique Cecyle lock hardware, the new rectangular Celestine interprets the signifying closure detail on a medium-sized crossbody purse for an alternative way to enjoy the Cecyle family. Cecyle’s many sides have been unlocked for Spring Summer 2019 leaving no mystery or limit to its undeniable charm.